With the year, and the holidays, winding down I try to find some time to catch up on recordings that I've missed. This year, I'm spending time with three CDs—two older recordings by Canadian artists and the new ArtistShare release by orchestral master Bob Brookmeyer. Special Angel is a set of duets recorded in 2002 by pianist Marilyn Lerner and guitarist Sonny Greenwich. It would be hard to think of two artists who come from more diverse backgrounds and interests. While Lerner has made her reputation with klezmer music, Cuban music, and her own idiosyncratic solo piano pieces, Greenwich has taken the influence of mid-period Coltrane and spun it out through his own highly personal view of the world, in which Paul Klee, Ravel and Miles Davis hold equal weight. What brings them together, I imagine, is both their openness and innate spirituality. Whatever it is, the results are beautiful. There is a painterly connection to my second Canadian selection, too. In 2001, guitarist Tony Quarrington and some of Toronto's top musicians (including Jane Bunnett, Don Thompson, Barry Romberg and Kirk MacDonald) recorded a suite of music inspired by the ground-breaking works of the Group of Seven—the loose-knit school of Canadian landscape artists who dominated the field in the 20th century. The connection between visual art and music is endlessly fascinating, and Quarrington's compositions aim to capture the sense of space and awe of nature that these seven painters explored so masterfully. Brookmeyer's new CD didn't make it onto my player(s) for top 10 consideration, but it's high placement on New York Times jazz critic Ben Ratliff's list made it a must-hear. Brookmeyer has been overlooked in recent years, but he remains the inspiration for young, higher-profile artists like Maria Schneider and John Hollenbeck (who plays on this CD) and as vital as he was 25 years ago. Featuring his New Art Orchestra and seven new compositions, Spirit Music is first rate. It tells you all you need to know about life in a very white Canadian city in the early '60s to discover that I first heard about James Brown in an Archie comic book. If memory serves—and it was, after all, 1964 or something—Betty and Veronica were musing about what music they would continue listening to in the coming year, and one of them (likely the more soulful Betty) opined that James Brown would continue to groove her world. When I saw the T.A.M.I. show sometime in the following months I knew what Betty meant. Suddenly, the up-to-then-oh-so-cool Mick Jagger seemed like a little boy—even to my little boy eyes. James Brown was, literally, the man. Nat King Cole and Sam Cooke were the only black singers heard on Canadian radio with any regularity in those years, so I never had the thrill of hearing Mr. Dynamite alongside his pop and rock peers, and he remained an elusive thrill—seeming almost like an imagined dream as the T.A.M.I. experience faded from memory—until I was old enough to seek out the few recordings I could find. The fact that one of the most iconic and influential artists of the time was unavailable to me through the standard commercial avenues like AM radio taught me a lot about the need to seek alternative channels. For that, and so many other things, I owe James Brown an enormous debt. For one reason or another, I probably saw fewer concerts in 2006 than in any year in the past 25. Even so, a few register among the best I've seen, while a couple of others were less than anticipated—which, of course, may say more about my level of anticipation than anything else. Jerry Granelli's Sandhills Reunion produced one of my favourite CDs last year, and the band includes some of my favourite players—including Granelli and baritone saxophonist David Mott—so I was pleased when their performance here in Ottawa surpassed what they did in the studio. Even without clarinetist François Houle, who couldn't make this gig, the band expanded the compositions with tremendous imagination, and played off poet Rinde Eckert's performance with terrific empathy. The acoustics at the National Arts Centre's 4th Stage were characteristically perfect, and so was this performance. A truly electric event. Granelli's V16 provided a similarly electric show at a cramped loft studio in the Historic Properties district of Halifax. I was privileged to get an invitation to the taping of a live CD with about 30 others, and the band—Granelli, his bassist son J. Anthony, and guitarists David Tronzo and Christian Kögel—maintained a taut, energized hum throughout the performance. The tension was so tight that it seemed like the band might explode any moment, but the performance was the tension, and the release at the end was something else. Can't wait to hear the CD next spring. It will be out on Songlines. The Saturday and Sunday morning shows at the Guelph Jazz Festival have gained a reputation for being very intimate and very intense (Steve Lacy the year before his death, Hamid Drake and Gerry Hemingway, Matthew Shipp have been a few of the previous memorable shows) and this year's duets by Mark Feldman and Sylvie Courvoisier lived up to the expectation. I have a full review upcoming in Coda magazine, which I won't tip here, but this show combined exquisite music—much of it composed by John Zorn—and a true sense of joy between Feldman and Courvoisier that kept threatening to turn treacly-sweet but never did. Feldman has long been one of my favourite musicians in any genre, and it's great to see him relieved of the angst that has always seemed to be upon him. The year's biggest disappointment was not a bad show by any means, but how could Masada live up to my expectations? I've been fortunate enough to see them in some interesting settings, including one of their early shows at Victoriaville, where they played acoustic and held a large crowd spellbound, and at an ungodly hot, old synagogue on New York's Lower East Side—a show so good that John Zorn planted a kiss on Dave Douglas after one solo. At Montreal's Place des Arts, the quartet seemed like they were removed from the audience, and its performance, while smoking musically, was somewhat formulaic. This is one I wish I had a recording of; I'm sure it was better than I remember, and without the distraction of the large hall some of that distance I felt would disappear. 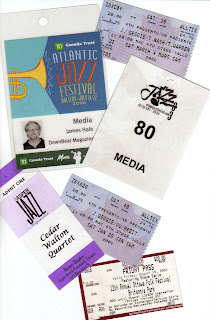 Time was when I felt I had purchasing tickets from Ticketmaster and similar services wired. If you began dialing into their phone system about five minutes before the tickets you wanted were released for sale you'd invariably get a place in the priority queue as soon as the system kicked in. Using this method I scored front-row seats for Miles Davis and a number of other popular acts—and obviously I'm talking about the 1980s here. It was a pretty simple business transaction, as it should be. With the introduction of the Internet, Ticketmaster, et.al., ticket sales went online, and the results have been routinely abysmal. I hear stories of system crashes and other assorted frustrations, and my one experience trying to score tickets for Bruce Springsteen's tour for The Rising illustrated just how far things had deteriorated. The next time I went looking for Springsteen tickets, I bought them from someone on eBay. Now, I'm lucky because I see more than enough shows that are comped that I don't have to deal with the system all that often, but occasionally there's a show that forces me into the online ticket meat grinder. Case in point: next summer's Keith Jarrett Standards Trio show at Montreal's Place des Arts. The Montreal festival is notorious for making precious few media tickets available for shows like this, so to ensure tickets I had to buy them when they went on sale last Saturday. Besides, the show's the weekend of my birthday and my wife loves Jarrett, so it works out all around. Except... the primary online buying method was to use Place des Arts' site, and the form was improperly formatted. I watched my Row C seats turn into Row F and then Row M while I tried to get it to work. No luck. No luck phoning, either; the line was busy each time I dialed. Finally, I tried Admission's site (the Quebec equivalent of Ticketmaster) and wound up with a pair in Row T.
Why isn't this easier? I can't imagine demand is that much higher for tickets like this than it was 20 years ago—especially when the face value for the Jarrett show is $100. How do these online ticket services mess things up so badly? Just another example of how the institutional side of the music business has missed the boat on technology. I just finished writing an article on new media and culture that reminded me of how badly the record business mis-judged what digital technology would bring, and this ticket thing is related. Although the concept of creating "instant" copies of live concerts is not new—The Allman Brothers Band, for one, has been doing it for a few years now—Dave Douglas' plan to distribute each of his sets from this week's stand by his quintet at New York's Jazz Standard is compelling. Not only is his band interpreting pieces he has released on previous CDs, he is also performing new music that hasn't been recorded yet. Not only that, but he's using a cornet rather than his traditional trumpet. So there are many opportunities to explore subtle shifts in his music. Recently, on his blog, Douglas discussed his fascination with the multiple-set recordings Miles Davis made with his mid-'60s quintet at Chicago's Plugged Nickel in 1965—his inspiration for the Jazz Standard set. Douglas' quintet may not be at the level of Davis' band, which revolutionized time feel for small jazz groups, but his Jazz Standard sets do have the added advantage of generating a "you are there" feel—without the NYC cover charge sting. Of course, you don't get to have the great ribs from upstairs at Blue Smoke! The death of bassist Walter Booker last Friday puts me in mind of my dear departed friend Eric Nisenson. Best known for his books Blue: The Murder of Jazz and Ascension: John Coltrane & His Quest, Eric was a regular at Booker's Boogie Woogie Studio in the mid-'70s after Eric had moved to New York City from San Francisco. From what Eric and Booker's ex-wife told me, the studio was quite a hang-out in those days, and Miles Davis was a frequent visitor. At Eric's request, Booker introduced him to Miles, sparking a four-year relationship that resulted in Eric's first book, 'Round About Midnight, which was his attempt to salvage an autobiography project that later resurfaced with co-author Quincy Troupe. Eric was never one to tell tales out of school, but he shared enough information that it's clear those were wild times around the New York music scene, essentially buried in a blizzard of cocaine. Some of this may likely resurface in a book that producer-saxophonist-composer Bob Belden tells me that he's writing, based on Davis's so-called "dark years," when Eric and few others were allowed into his brownstone on West 77th Street. Despite occasionally having his arm twisted into delivering drugs to Miles, Eric helped keep him connected to the outside world during those years, which is likely one of the things that eventually led to his resurfacing in 1981. So, in a roundabout way, we have Walter Booker to thank for that.